So far, my maternity style has looked a lot like my normal style—sweaters, skinny jeans (albeit with elastic waistbands) and booties—with the exception of one thing: the fitted dress. 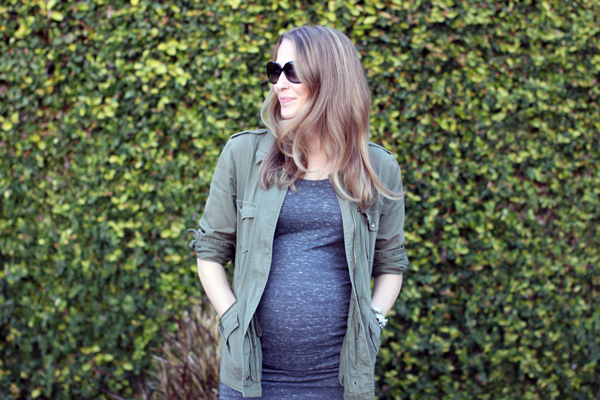 Now that I’m in my third trimester, I consider this ruched dress by Ingrid and Isabel a pregnancy must-have—so much that I have it in two colors (black and grey) and just might get a third. Once you have a bump, it’s fun to wear pieces that show off your new shape—when else will you be congratulated for having a protruding midsection?—and this dress does just that. More reasons to love this dress? The soft, stretch knit is incredibly comfortable and leaves plenty of room for a growing bump, while the side ruching is super flattering. You also can easily dress this versatile style up or down. It works just as well with booties and a jacket for daytime as it does with heels and fun accessories come date night. Ingrid and Isabel maternity dress. Velvet fatigue jacket. Sam Edelman booties. Michele watch. David Yurman bracelets. 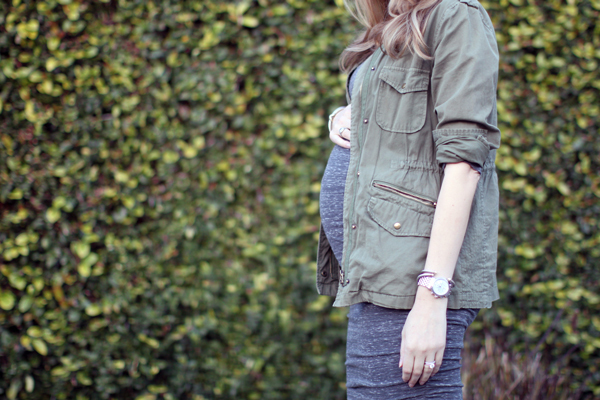 Do you have any must-have maternity wear? I’d love to hear about your favorite finds! Love Ingrid and Isabelle I had a long black tank dress by them that was my staple and all their tanks. You look so beautiful mamacita! Thanks for the tip, mama! I'm going to check out Isabella Oliver right now! xo! Oops, I think my earlier comment got swallowed by the ether. Love this dress and yoU!!! Blogger eats comments like pregnant ladies eat ice cream. Thanks for leaving me another one, Rebecca! Congrats on baby #2! xo!